Episode 4: Pearls everywhere, all the time! There are various pearl necklaces used, but the one mimicking The Queen’s favorite triple strand necklace is pretty well done. Episode 5: This made me smile, because while this particular combination of jewels has never been worn by Her Maj in public – the Grand Duchess Vladimir Tiara and Queen Alexandra's Wedding Necklace, with the Duchess of Gloucester's Pendant Earrings – it is a combo I've long hoped to see. Points for reading my mind. Of course, The Queen wouldn’t have worn this necklace because it was with her mother, and they may be cutting things a little close with the timeline on the tiara and earrings and other jewels that were inherited from Queen Mary. Episode 5: Coronation scenes in movies never fare very well when judged on how good the jewels look, do they? The crown(s) are the hardest things to replicate. Episode 5: In real life, Princess Margaret wore the Cartier Halo Tiara to the coronation, and I’m really surprised they didn’t do that here. It's not like it's hard to find a replica of that one these days. Instead, we have a tiara that vaguely resembles a couple pieces owned by Queen Mary. The Queen Mother is pretty faithful to history, in the circlet of her crown with three collet necklaces and Queen Victoria’s Fringe Brooch. 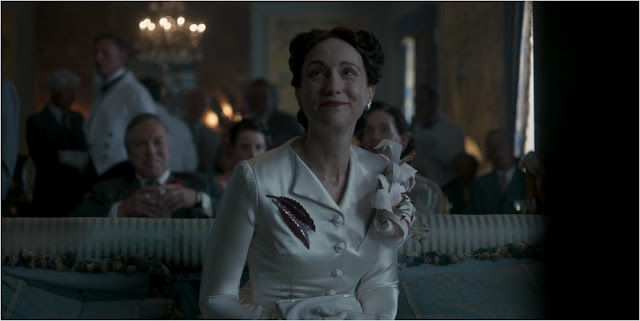 Next to her at the actual event would have been The Princess Royal (Princess Mary, Countess of Harewood), who was dripping in sapphires and diamonds and probably knew where her Royal Family Orders should go. 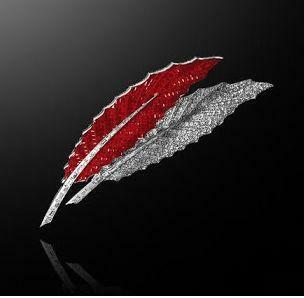 Above is The Duchess of Windsor's real ruby and diamond feather brooch from Van Cleef & Arpels, which Wallis wore positioned the way it was in the series. Episode 6: A great deal of the first season deals with the saga of Princess Margaret and Peter Townsend. I don't think they captured Margaret very well, honestly, and they really didn't capture her jewels. I can understand reusing the pieces on hand, but Queen Victoria's Golden Jubilee Necklace on Princess Margaret does stretch the limits of my imagination. To be continued...This is not the last time we’ll see Princess Margaret wearing something she’s not supposed to wear. More in our next and last installment!